Well, Colorado State WR Michael Gallup crossed the Pacific Ocean every week. 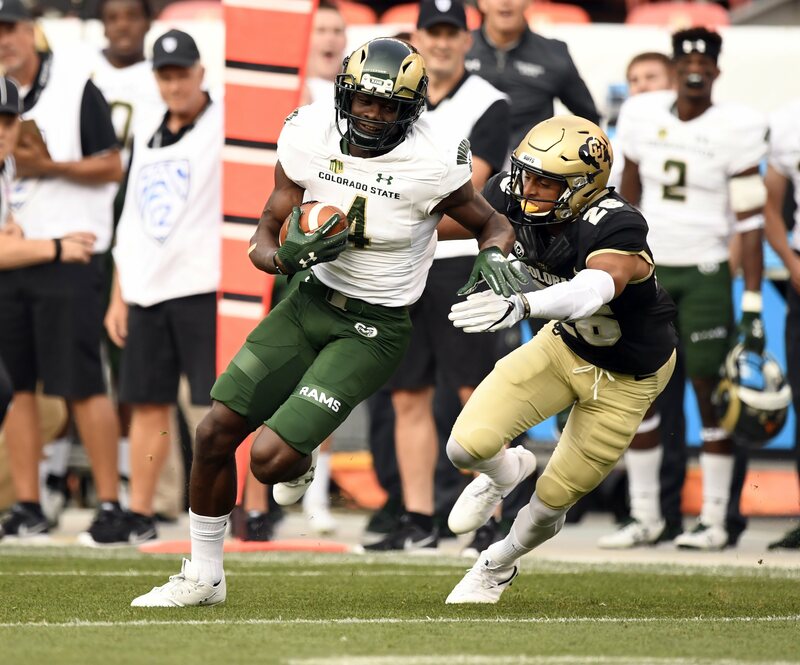 The 21 year old Gallup caught 100 balls last season for Colorado State, finishing with 1,413 receiving yards and 7 touchdowns. At 6’1″ and about 200 pounds, Michael Gallup is the perfect productive Z receiver that any NFL offense would want. When you watch the film, Michael Gallup checks nearly all the boxes. He has strong hands, is very physical, is a smooth route runner who creates easy separation, and has no fears about going over the middle to make plays. Gallup is a really tough player who is rarely brought down by one defensive back. He is strong at the catch point as well, and has some of the most reliable hands of the entire draft class. Gallup consistently proves he can go over the middle and catch the ball in tight windows. He has long arms and trust in his hands. Both of these qualities allow Gallup to extend his catch radius and to bring the ball into his body in traffic. Gallup also possesses the ability to adjust to the ball in mid air. This body control makes him a candidate to be a serious red zone threat at the next level. Gallup is also extremely dangerous after the catch. Much of the NFL has moved towards a more underneath passing game, looking to get the ball out of their quarterback’s hands quickly. This has placed an increased importance on the wide out’s ability to create YAC, and Michael Gallup does so really well. Against Toledo here, Gallup adjusts his slant route to find the soft spot in the zone. Once he gets behind the backers and underneath the safeties, Gallup turns his head and looks for the ball. He smoothly brings the ball into his hands, and then does the rest with his legs. Gallup also shows off his strong stiff arm on this play, as well as his balance and body control down the sideline. As I mentioned earlier, Michael Gallup creates “easy” separation against defensive backs. He doesn’t make the catch here, even though he does extend in the end zone to attempt to snag the ball, but his smooth route running and functional speed is on full display. Gallup freezes the defensive back with his footwork, selling that he is cutting to the outside while sinking his hips. He then breaks to the inside and uses his speed to separate down the middle of the field. If the ball was put on target this would’ve been an easy touchdown for Gallup. Lastly, I want to talk about how smart of a route runner Michael Gallup is. To demonstrate this quality, let’s check out this touchdown against Idaho. Michael Gallup is the outside receiver on the bottom of the screen. It looks like the tight end in the slot is running a deep out, getting to the goal line and then breaking his route out. Gallup appears to be running a drag route, where he would work underneath the coverage. As Gallup works into the drag, he reads the defense and recognizes they are in zone coverage. The defender on the near side steps down to cover Gallup’s drag route. Once he recognizes the coverage, and realizes there is no safety in the deep middle of the field, Gallup breaks his drag route upfield and behind the underneath linebackers. Because of his understanding of the coverage and the offensive concept, Gallup finds a way to score an easy touchdown. I don’t believe he is WR1 or anything, but Michael Gallup is one of my favorite prospects in the 2018 NFL Draft class. He has all the makings to be an effective Z receiver at the professional level, and if drafted to the right situation he could have a really productive rookie season for someone. Fantasy Football: Where’s the Best Fit for WR Allen Robinson?